Salone Satellite - Young designers showcase, Milan 2017. Each year 300 stands are erected for design schools, young designers and studios at the rear of halls 22-24 at Salone del Mobile. While its a long march from Hall One of the main entrance to the fairgrounds, its always worth the effort. 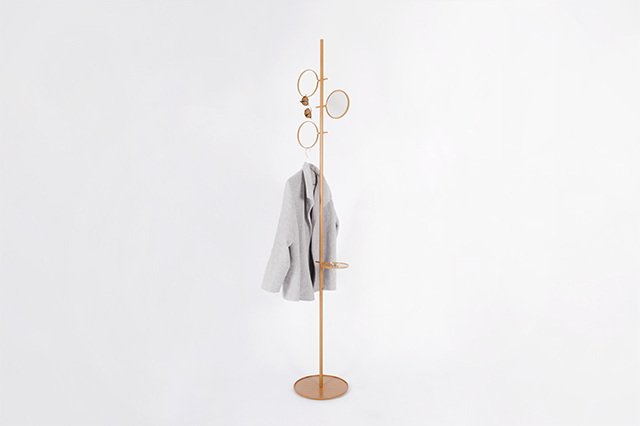 Here you find a mixture of young established designers who have been continuously innovative in their work over many years such as Dutch designers David Derksen and RENS along with total newcomers. The rules for Salone Satellite are simple: each designer needs to be no more than 35 years of age and each entrant can only exhibit three times. The rest is up to the judges who except or reject entrants on their merit. Salone Satellite was established in 1998 which makes this year quite special and to celebrate the platform had a fabulous new look at the fair and a held a major exhibition of work from the last twenty years at Fabbrica del Vapore entitled Salone Satellite – 20 Years of New Creativity curated by Beppe Finessi. Salone Satellite 2017. The twentieth year of Marva Griffin Wilshire's wonderful platform for young designers held at the Salone del Mobile fairgrounds in Rho. Photograph by Craig Wall. More than 10,000 designers have participated in Salone Satellite over the previous 19 years, many of whom have gone on to become highly successful such as Matali Crasset and Patrick Jouin (France), Harri Koskinen and Ilkka Suppanen (Finland), Tomoko Azumi and Nendo (Japan), Sean Yoo and Cory Grosser (USA), Front and Johan Lindstén (Sweden), Xavier Lust (Belgium), Daniel Rybakken and Hallgeir Homstvedt (Norway), Satyendra Pakhalé (India), Federico Churba (Argentina), Lorenzo Damiani, Tommaso Nani, Cristina Celestino and Francesca Lanzavecchia (Italy), to name just a few of the brightest stars. Salone Satellite 2017 - the entire look of the event was more polished than previous years with on trend colours and interesting signage at the entrance. Great displays in the common areas exhibited the work of successful past designers. The long wall of Salone Satellite 2017. The folding signage had a great dimensional quality in combination of plywood and shades of blush - the de rigour colour of the Salone (again). Inside Salone Satellite the 20th anniversary installation showcased many of the designers who have had products put into production over the years - the chair in red below is the 'Astra' by Cory Grosser, the pendant lights are 'Fluid Edition' by Nao Tamura and Cristina Celestino's 'Alice' table lamps in exotic marbles are shown at the back. One of the areas exhibiting a selection of products that have gone into production by designers who have participated in Salone Satellite over the last 20 years. Photograph by Craig Wall. 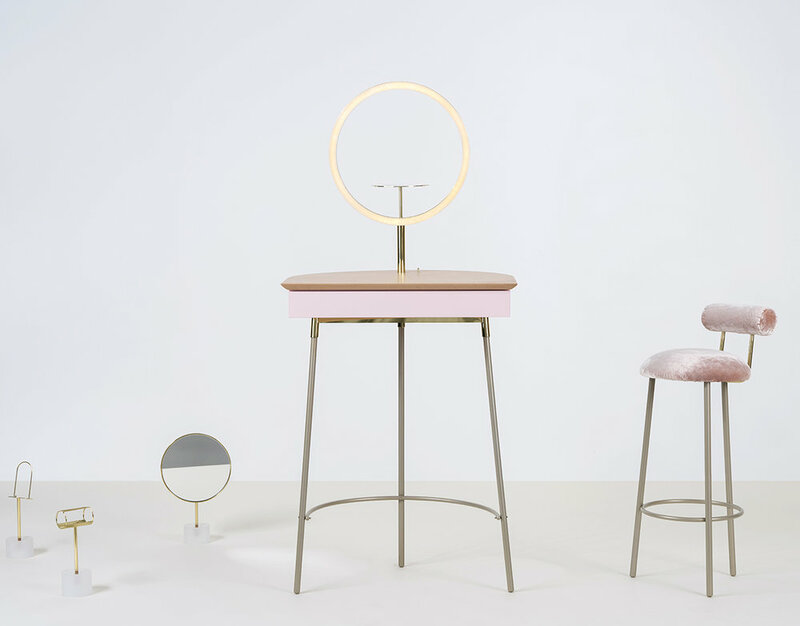 While its true that the stands of certain designers who had exhibited previously stood out immediately, like every year there were some new faces that really raised the bar. Design daily was particularly taken by the lights of Greek designer Chris Basias and the refined minimalism of Japanese studio Daisuke Kitagawa but there were plenty of other great presentations spread across the stands and those that are highlighted in this post are just the tip of the proverbial iceberg. What is so nice about Salone Satellite is that you can talk to the designers directly about the whys and hows of their design process. It's hugely stimulating and grounding at the same time because you immediately realise the amount of effort that goes into designing these prototypes - sometimes years of research has been involved. The stand of Greek designer Chris Basias was right on trend from a colour and materials point of view but also delivered some interesting and highly original concepts. Photograph by Craig Wall. Daisuke Kitagawa works under the name of Design for Industry. He started his studio in 2011 having worked for NEC for many years. Now Based in Tokyo KItagawa is a lecturer at the Kanazawa School of Art and a NEC management partner. 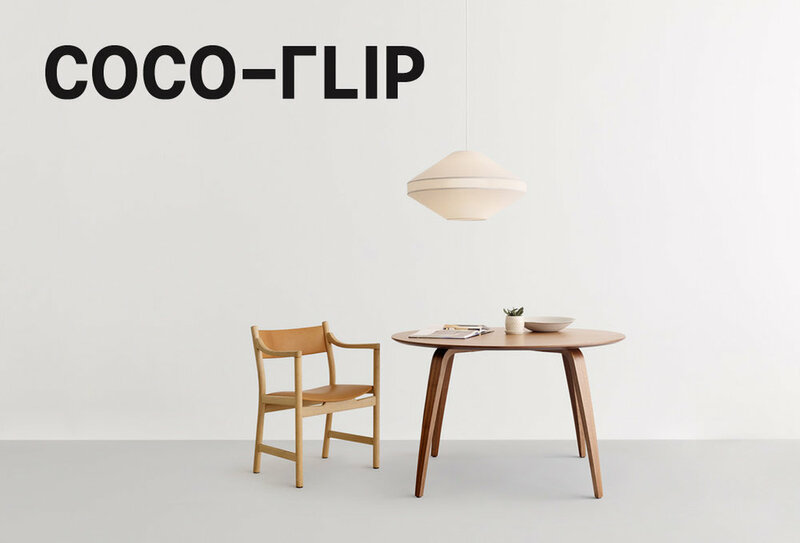 He s also a very talented designer of simple furniture and lighting pieces that offer a lovely mix of Japanese minimalism and modernity. At the stand at Salone Satellite this year he displayed the 'Struct' stacking chair and 'Lattice' cabinet made from felted wool and wood along side the 'Floe' glass coffee table and the 'Trio' coat stand (barely visible in its white-on-whiteness in the image below) 2017 was the third and last time KItagawa will be able to present at Salone Satellite. His 'Trio' coat stand is also shown in the vertical image below on the left with this 'Street' floor and table lamps on the right. The stand of Daisuke Kitagawa from Japan. 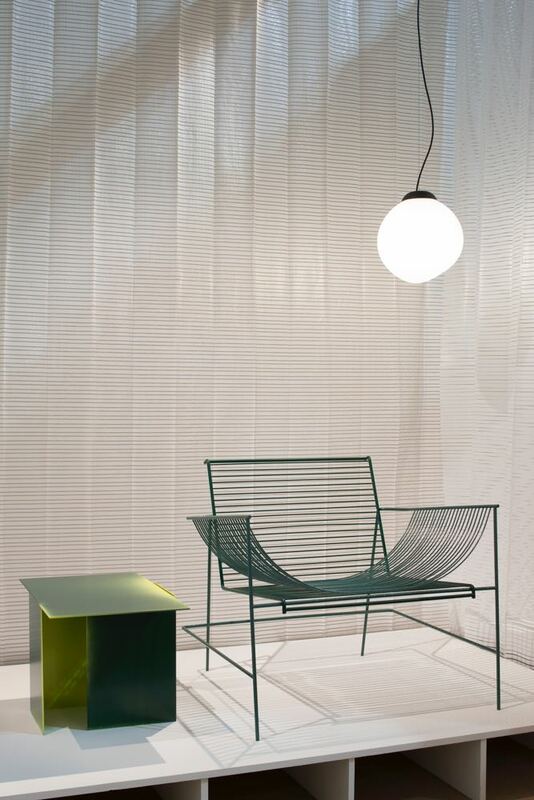 The minimal 'Struct' stacking chair in green Kvadrat Divina fabric against the 'Lattice' cabinet with its screen like doors in the same material was absolutely perfect. Photograph by Craig Wall. 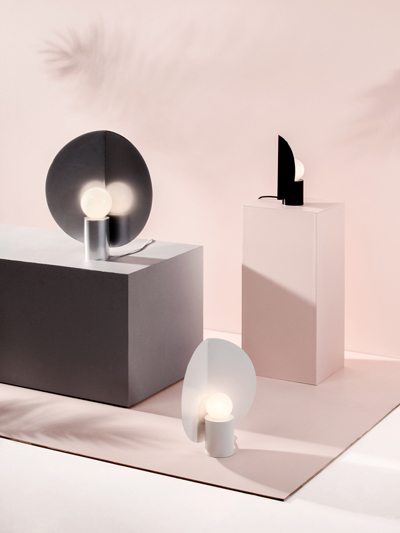 Loumo Collective's graphic stand featured Elena Ulvio's wonderful 'Lampi' folding trays on the back wall and some new lighting products by Laura Väre and Hanna Särökaari. All three women hail from Finland. Photograph by Craig Wall. 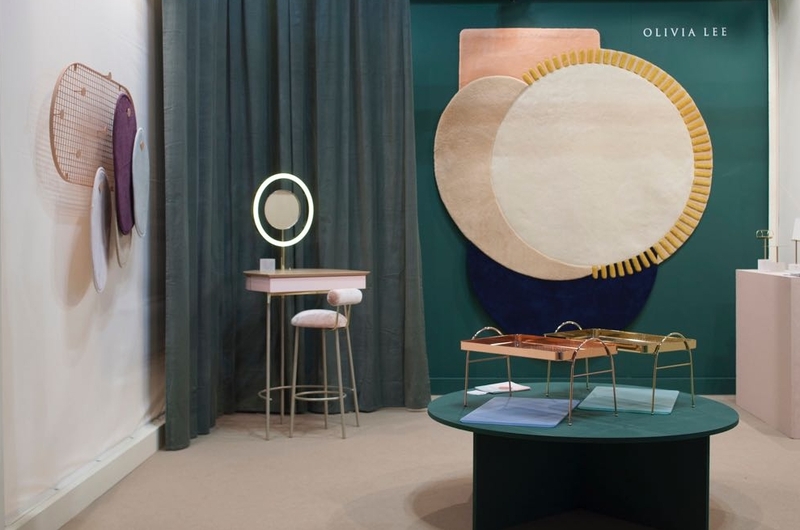 Singapore designer Olivia Lee presented a beautiful stand that encapsulated her interest in colour and overlapping elements. 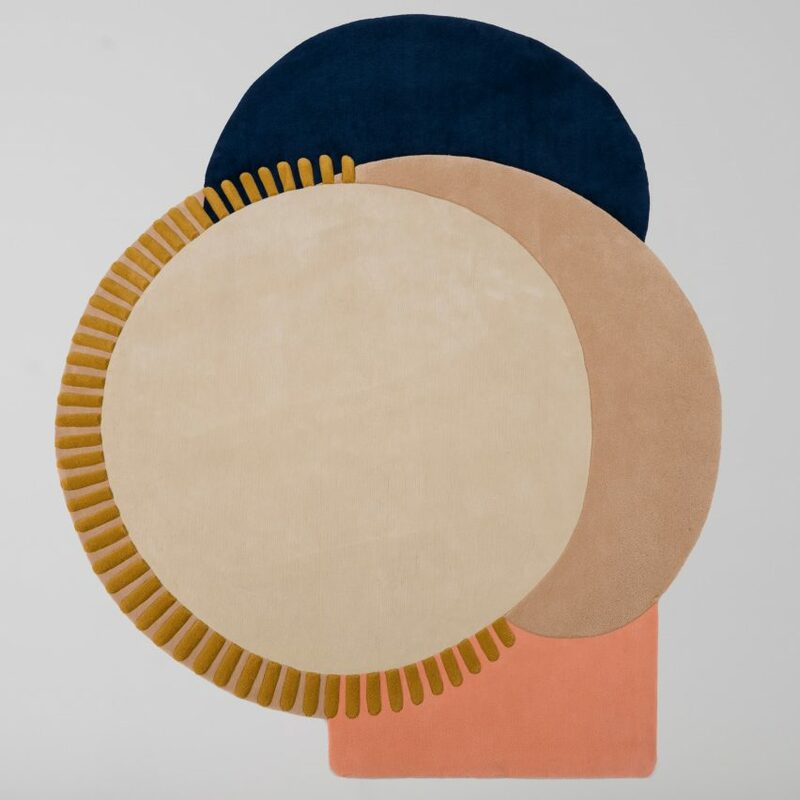 Her studio investigates the areas that coalesce between wonder, technology and humanity and this was represented quite literally in her 'Athena' rug which has a very soft human feel involving overlapping circle shapes. Lee is a graduate of the Central Saint Martins College of Art and Design and worked under the mentorship of Sebastian Bergne for several years while living in London. In 2011 Lee returned to Singapore where she has set up her own studio and lectures at the National University of Singapore. Olivia Lee is a designer from Singapore. 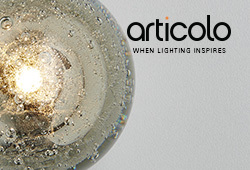 Her 'Athena collection' garnered a lot of praise during design week. Photograph by Craig Wall. Studio Finna is another female design studio from Finland. 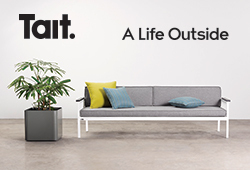 Anni Pitkäjärvi (pictured below), Hanna-Kaarina Heikkilä and Marianna Niskala work with clients from the Swedish giant Ikea to up and coming Danish brands like Woud and Finnish brands such as Artek. The studio presented new work that revolved around fine steel forms across seating, storage and lighting categories. Studio Finna provided interesting shapes enclosed in fine lines of steel. One of the founders of the studio Anni Pitkäjärviis pictured here. Photograph by Craig Wall. 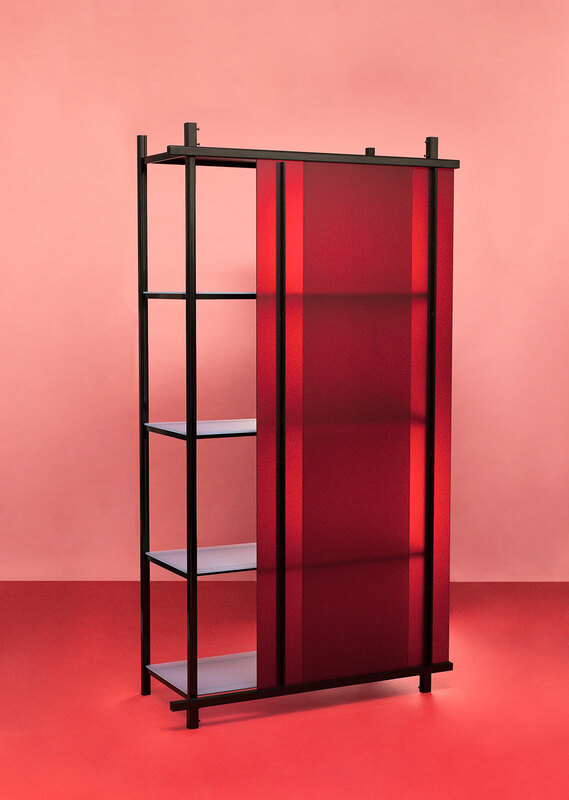 Australian designers Edward Linacre and Viktor Legin are like the odd couple - Linacre is extremely tall and red headed, while Legin is fair and rather short but together they have developed a wonderfully balanced approach to their work as Copper I.D. 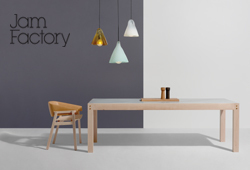 Between Linacre's nature inspired, mathematics driven ideas and Legin's minimalist industrial design approach they have chalked up a number of industry awards including the third prize Salone Satellite Award in 2015 for their 'Balance' light and runner up in the Design Report Award in 2013. 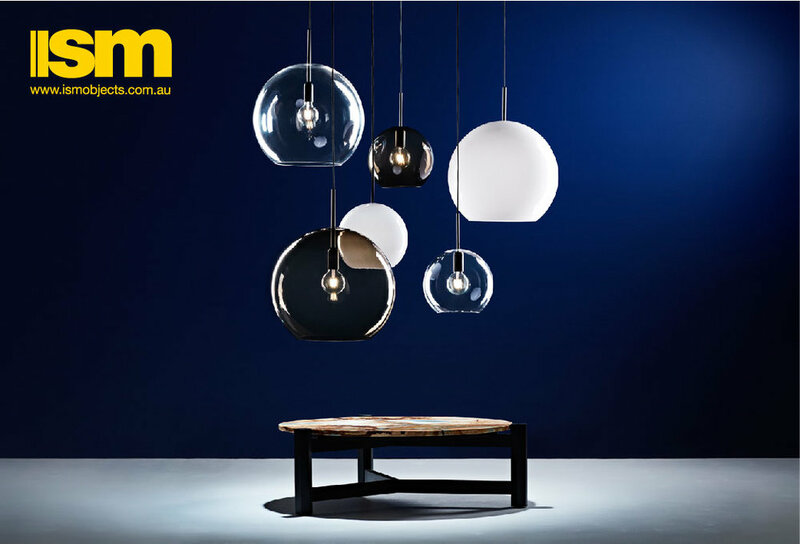 This year the duo focused on their disc like their 'Concrete' pendant lights (right) in open pore concrete and 'Convex' pendants in spun metal (left). 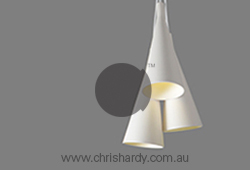 Their big crowd pleaser, the 'Nest' wall fixture is shown on the back wall. 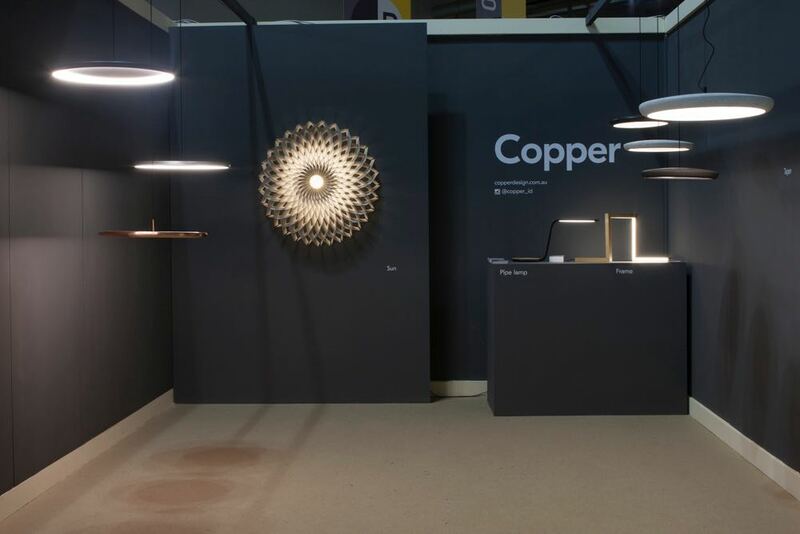 Australia's Copper I.D showed their minimalist lighting work for a second time. Co-founder of the studio Edward Linacre had showed previously with the Melbourne Movement in 2013. Photograph by Craig Wall. 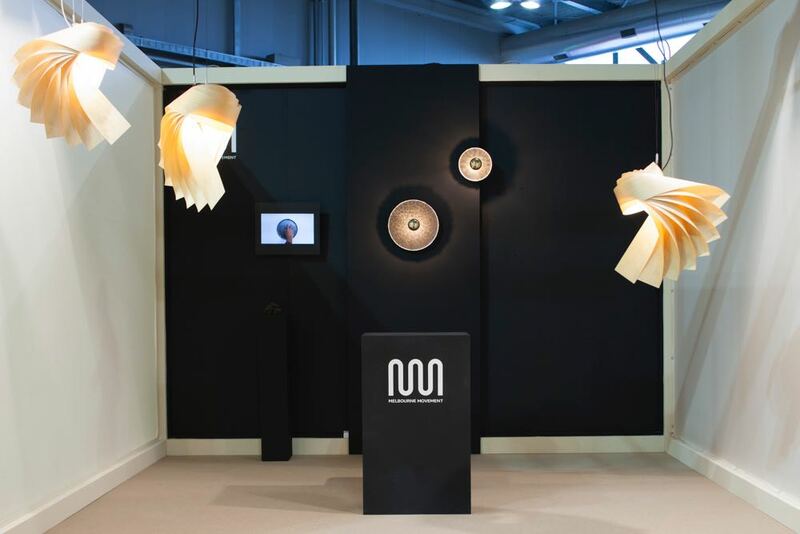 The Melbourne Movement stand was a stripped back affair showing just three 'Lumaneer' lights by Eun Hai Kim (foreground) and a pair of 'Igneous' lights by James Walsh & Ash Allen (rear). The Melbourne Movement is the platform founded by the recently deceased Kjell Grant and administered in recent years by Ian Wong for design students from RMIT and Monash University in Victoria (Australia). The Melbourne Movement. Photograph by Craig Wall. Dutch designer David Derksen came to fame with his aged mirrors designed in collaboration with Lex Pott in 2010. What Derksen doesn't know about metal processes isn't worth knowing. HIs work is always beautifully executed and finely crafted - even when they involve highly industrialised processes.. On his stand at Salone Satellite this year he displayed a finished version of his new 'Foam' lights made from a strange foaming metal that can be formed into precise shapes along with examples of his lighting pieces from the 'Moire' series lamps in finely perforated metal. He also revealed a new screen/space divider design in timber called 'Grid' (in the image below on the right). The screens are made from larch wood veneer from the Baars & Bloemhoff’s Shinnoki collection and have the potential to house LED lifting and acoustic treatments to provide complete spatial treatments for offices, restaurants and homes. David Derksen chose curtains to go with his delicate moire objects and interlocking timber screens. Photograph: Craig Wall. Susanne Roser and Martina Staub are two young Swiss designers who founded Diiis Studio in 2016 after studying at HSLU Lucerne and FHNW Basel respectively. While their products seem extremely simple initially it is discovered on close inspection that they are beautifully detailed with hidden elements like the integrated fold out bookends found on the 'Hawu' shelves. While their work is extremely minimal, their philosophy is to find the perfect balance between functionality, simplicity and aesthetics. Diiis is a studio from Switzerland. Their 'Glaubie' mirror and clothes stand was particularly appealing. It has already been taken up by Swedish company Fogia. Photograph by Craig Wall. The work of Eindhoven based RENS (Renee Mennen and Stefanie van Keijsteren) has always been fascinating but often initially more about the research than the product. This can be be a little abstract at times but pays dividends in the long run when this same research leads to a clever product down the track. 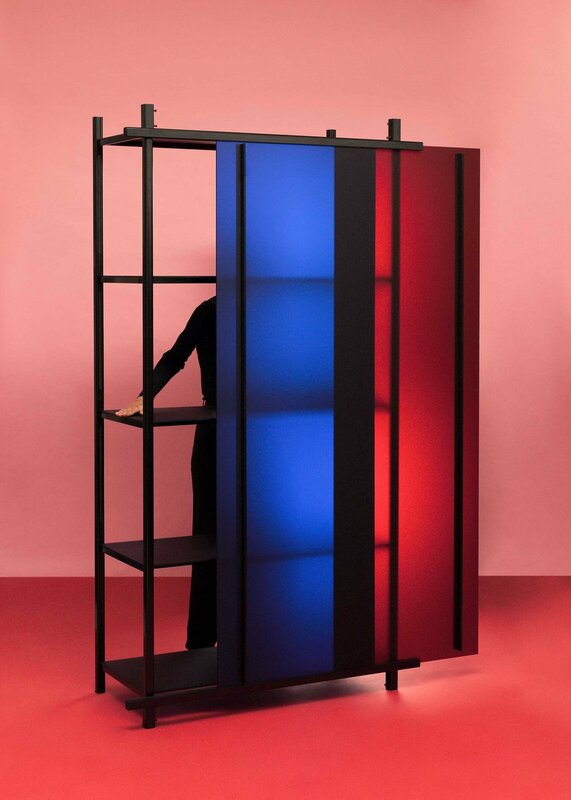 This is the case with their 'Split & Store' cabinet which was on display at Salone Satellite. The cabinet uses a version of additive colour theory in the form of acrylic sheets to create a dynamic piece of furniture that changes colour with the amount of light passing through it and by how much of an overlap the two acrylic sheets have at any given time. RENS have been researching colour for many years and have become expert in a range of different ways to create gradations in single colours - from dip dying surplus commercial carpets to create desirable rugs through to an entire exhibition around the controlled exposure of printing inks to UV and its effects on various colours. 'Split & Store' formalises this research into a flexible, beautiful and highly useful product. Austrian designers chmara.rosinke (Ania Rosinke and Maciej Chmara) founded their studio in 2011 in Vienna and have been exhibiting their work extensively since this time with involvement in platforms like DMY Berlin and events such as Prague Design Week. 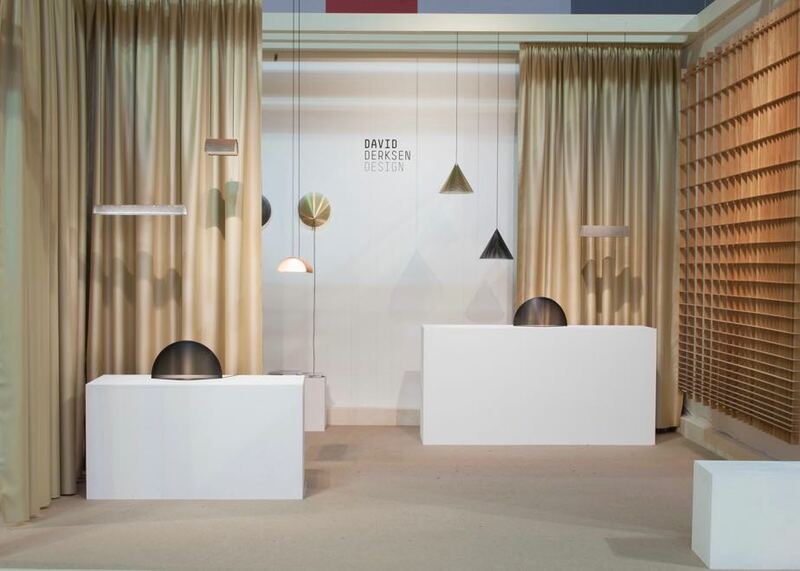 On their stand at Salone Satellite they exhibited several new designs including some delightful decorative wall panels, a geometric rug and a new timber chair that plays with exaggerated versions of shapes commonly found in Danish furniture. Chmara.rosinke Studio from Austria exhibited a number of graphic ideas across rugs and wall pieces in combination with timber seating that played with simple archetypal forms. Photograph by Craig Wall. Studio Truly Truly are two Australian designers Joel & Kate Booy. After completing a post graduate degree at Design Academy Eindhoven, the designers decided to stay and set up their studio in the Netherlands. The duo are currently based in Rotterdam and enjoy the support of industry there, working on research projects with manufacturers to understand the special processes that each industry involves. For this year's Salone the duo presented new works in metal - a bent rod chair called 'Wove' that explores interlaced wire shapes and the 'Daze' side tables that experiment with powder coating techniques to produce a new random finish that follows and expresses the shape of the form. The busy pair also presented a sofa for Ikea upholstered in a huge number of Ikea's ready made cushion offering. The studio also launched new works in ceramic and glass. You can see a previous Design daily post on their work here. 500 hundred objects by 500 hundred designers were displayed at the exhibition Salone Satellite: 20 Years of New Creativity. The exhibition was divided in to three naives - each naive grouping a selection of former participants of Salone Satellite into one of what are considered the three major design approaches. As a means to encapsulate the best of young design over the last two decades it could not have been bettered. Todays big names like Matali Crasset, Patrick Jouin and Nendo have all had the good fortune of going through the Salone Satellite system. The exhibition Salone Satellite: 20 years of New Creativity curated by Beppe Finessi. The exhibition was held in the vast cathedral-like hall of Fabbrica del Vapore near Porta Garibaldi. Helen Kontouris' 'La La' lamp for Kundalini can be seen in red in the foreground. Photo by Andrea Mariani.